The Ex-Worker is back! We may have taken a break, but social struggles and resistance across the world have not. 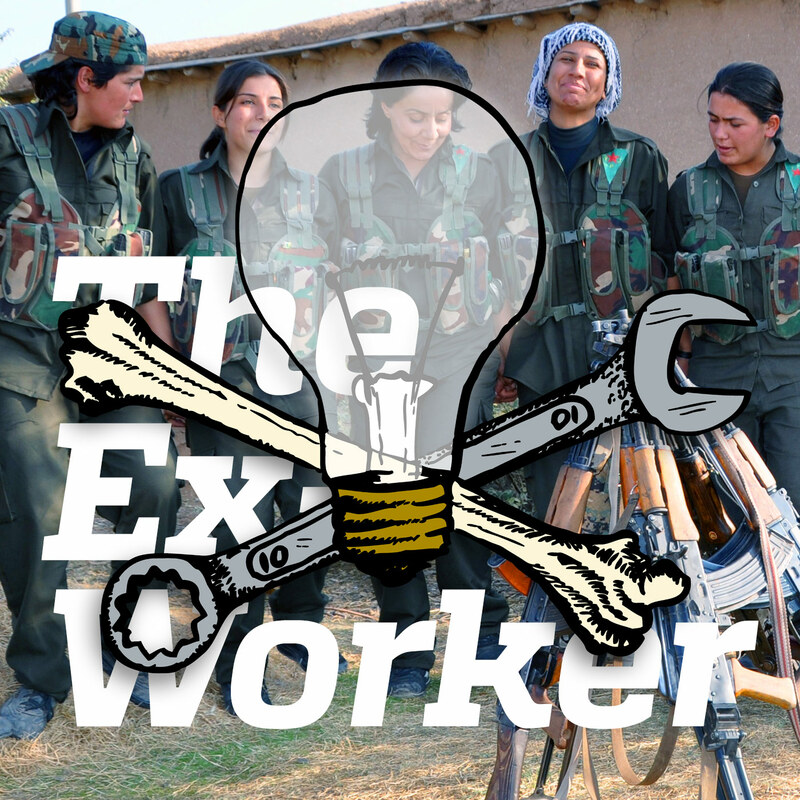 In this episode, we focus on the unfolding social revolution in Rojava or western Kurdistan, where an ambitious set of political, economic, and military experiments are transforming the lives of hundreds of thousands of people. In the borderlands of Turkey and Syria, self-organized militias have successfully opposed the Islamic State while challenging gender oppression and securing autonomy for an emerging stateless society. Interviews with supporters from the Turkish group "Revolutionary Anarchist Action" (DAF) set the stage, complemented by a Kurdish refugee and activist's reflections on the role of women's resistance to patriarchy. We also review "A Small Key Can Unlock a Large Door," a recently released anthology of texts describing the Rojava revolution, and continue our yearly tradition of a lively report of May Day actions across the globe. We also respond to a variety of listener feedback, with discussions of the Ross Ulbricht case, anarchist parenting, and how even spambots are impacted by recent revolutionary struggles! In this episode’s main feature, we included excerpts from several interviews about the social revolution in Rojava. The CrimethInc. feature “Turkish Anarchists on the Fight for Kobane” collects correspondence with members of Revolutionary Anarchist Action (DAF) from Istanbul, as well as an edited transcription of the Crna Luknja interview with a member of DAF. We also played a clip of an excellent Dilar Dirik interview with the Chicago-based radio show This is Hell, transcribed and brought to our attention by our friends at Antidote Zine, as well as a short clip from a talk by David Graeber. Also check out Dilar Dirik’s blog. On the Chopping Block, we reviewed “A Small Key Can Open a Large Door”, a collection of texts about the revolution in Rojava, recently released by Strangers in a Tangled Wilderness and Combustion Books. You can also read the introduction online, which we highly recommend! In our listener feedback section, we discussed the case of Ross Ulbricht, recently convicted of running the Silk Road website for unregulated internet commerce. We also mentioned we would post the correct links to “Accomplices Not Allies: Abolishing the Ally Industrial Complex”, and the anti-colonial convergence coming up in St Augustine, Florida this September. Those interested in anarchist parenting might want to check out The Rad Dad Book, based on a long-running zine; this zine on anarchist parenting, and a new anthology called Don’t Leave Your Friends Behind: Concrete Ways to Support Families in Social Justice Movements and Communities. If you want to share your stories of raising kids with anti-authoritarian values, drop us a line to podcast at crimethinc dot com. Don’t miss the Stimulator’s latest episode, “May Day is Gray Day”, for a lively reportback from our favorite holiday. On the first weekend in April, anarchists in Ljubljana, Slovenia hosted an anarchist radio gathering, which brought together participants in several different radio projects across Europe to share skills and coordinate their efforts. Listen to the joint production made during the gathering on the website of Crna Luknja, the Slovenian anarchist radio show. The anarchist publishing company AK Press suffered a serious fire at their warehouse, which killed two people in the neighboring building and destroyed a devastating amount of their merchandise. They’re raising money to get back on their feet; if you want to show them some support, you can visit gofundme.com/AKPressfire.